Mary Toomey, Ph.D., trained as a biologist, botanist, entomologist, and soil ecologist. A keen gardener, she has been growing and studying clematis for more than 30 years. She is currently editor of The Clematis, the journal of the British Clematis Society. She lectures widely on clematis, gardens, and gardening, and has written a number of previous books and articles. Born in Jaffna, Ceylon (now Sri Lanka), she now lives in Dublin, Ireland. 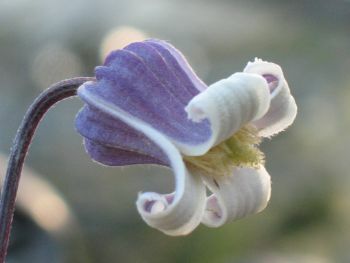 Clematis Doctor Mary is a low growing, free flowering clematis that has these lovely 'urn' shaped blooms, and the sepal recurve at the tips, the flowers are only about an inch long but they are very intricate.